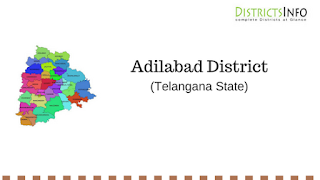 Adilabad District with Mandals in Telangana State: Adilabad district is Second Largest district of Telangana state. It is the second largest district of Telangana state with highly resourceful region. District has 18 mandals. There are different opinions on how the region got its name. The name is after Mohammad Adil Shah who was the Bijapur Sultan and ruled this region says one of the stories. Another story about the name is that it was earlier called Edulapuram and gradually it became Adilabad. Adilabad became more popular during the ruling of Mughals. The region was well developed financially under the ruling of Aurangazeb. Adilabad region also played an important role in freedom fight for independent India.Adilabad Tourism spots are very popular among those who visit the state. Adilabad district occupies an area of 16,128 square kilometers. The Adilabad district was situated between 77.46′ and 80.01′, of the eastern longitudes and 18.40′ and 19.56′, of northern latitudes. The district is bound on the north by Yeotmal and Chanda district of Maharastra, on the east by Chanda district, on the south by Karimnagar and Nizamabad districts and on the west by Nanded district of Maharastra State. River Godavari flows through Adilabad district and separates Nizamabad and Karimnagar districts from Adilabad district. Godavari river is the most prominent river that flows through the Adilabad district. The P engage, the Wardha, and the Pranahita are the next significant rivers. The Kadam and the Peddavagu are tributaries of the Godavari river. There are also small streams like the Santana, the Swarna and the Suddavagu which flows through the district. From the northwest to the southeast The Sahyadriparvat or Satnala range pass across the district for about 281.5 Km. Mahbubghat is the highest peak in this range. Forest in the Adilabad district covers 44.8 percent of the total area. The dry deciduous forests of Adilabad are restricted for the convenience of forest management into Teak forest and Mixed Forest. This forest is famous for teak trees, which covers 58.49 percent of the whole forest. Tiger, wild bore, bear, deer, Nilgai, bison, monkey, long-tailed monkey are some of the wild animals inhibited in the district. 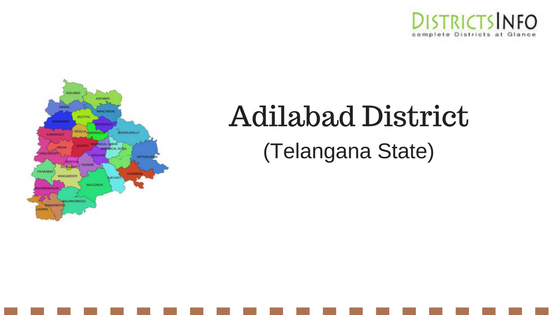 Adilabad District is rich in mineral resources, important deposits of coal, limestone, iron-ore and cement-grade lime stone and clays are found beside several other Minerals. Adilabad district has various tourists places like Pilgrimage, waterfalls, wildlife sanctuaries, Dam and reservoirs, arts and Handicrafts to visit . PILGRIMAGE- Basara Saraswati temple, Jainath temple, Gudem Sathyanarayana swamy temple, Sirichelime Shivalayam. WATERFALLS- Kuntala waterfalls, Pochera waterfalls. WILDLIFE SANCTURIES- Kawal Wildlife Sanctuary, Sivaram Wildlife Sanctuary, Pranahitha Wildlife Sanctuary. DAM AND RESERVOIRS- SRSP Project Dam, Kadem Dam, Sathnala Dam, Penganga Reservoir.